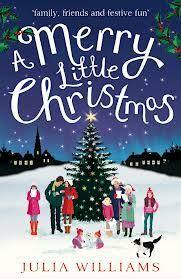 A Merry Little Christmas by Julia Williams has to get top marks from me for the traditional festive cover, a snow covered setting with a family singing carols around the tree and yes a nice sprinkling of glitter in the title, oooooooo I am looking forward to this one! Balancing her job as a school teacher with twins and her step-son Steven isn’t easy for Marianne North. With her husband’s ex causing trouble, life is getting even trickier. As Cat, Pippa and Marianne help each other through a difficult year, they’re all hoping for a much brighter Christmas. I adored all the storylines surrounding each of the characters and the author manages to bring all the characters together so that their stories come together and each of the characters support each other which shows the solidarity of the friendship between Pippa, Marianne and Kat. The relationship between these characters seemed so natural. Many day to day challenges are focused on in this book from budget cuts and how they have an effect on families, to the challenging demands disabilities have on loved one’s. There is also another situation regarding Cat’s daughter Mel which I can not mention as it would be a spoiler alert, but the way the author manages to show us both Cat and Mel’s feelings on the matter was very realistic and well written. Julia Williams does bring us a little festive read but she also managed to bring a tear to my eye on a couple occasions but particularly on page 264 so be aware. I didn’t realise that A Merry Little Christmas was a sequel and personally I didn’t have a problem reading it as a stand alone boo, I did find it took a little while to get used to who was who which maybe had I read the first book I may have found it easier to tell the characters apart easier but I still thoroughly enjoyed this book anyway! This is one of my favourite Christmas books this year and one I highly recommend I may even treat myself to Last Christmas if I have pennies left at the end of the month just to meet the characters again!